As we wrap up the 2015 growing season, our thoughts turn to preparation for 2016, and with current commodity prices, making sound decisions is as critical as ever. When it comes to nitrogen, the form of nitrogen applied to the soil, the timing of that application, the weather and crop uptake each have a significant impact on the fate of nitrogen in the soil. 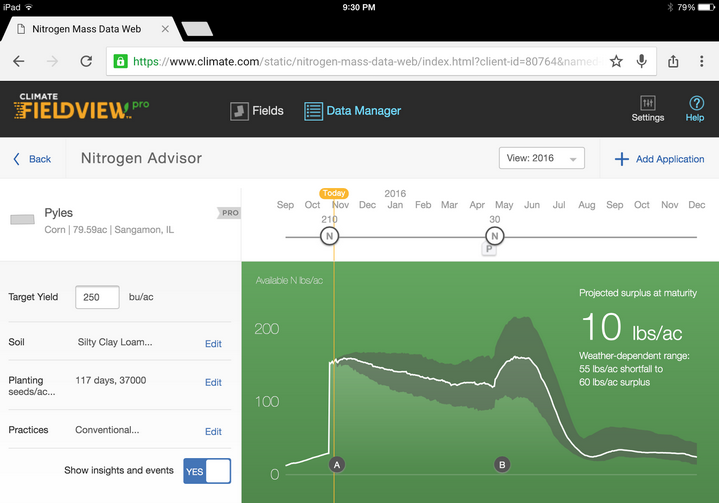 Nitrogen Advisor in Climate FieldView Pro can help farmers identify the impact timing has on their fall nitrogen applications, ultimately helping farmers use nitrogen as efficiently as possible to reach their yield goals. Next to water, nitrogen is one of the most critical applications in a farmer’s corn crop. At the same time, nitrogen is one of the most expensive applications. The penalty for under or over application has significant implications to the bottom line of any farming operation. To top it off, add the pending litigation and regulation around nitrates in water supplies – and nitrogen becomes a pretty serious topic. All farmers want to do the right thing. They want to maximize the efficiency of their nitrogen investment to create the most yield without wasting money or potentially harming the environment. Getting all the aspects of your nitrogen application right takes a lot of thought and planning. 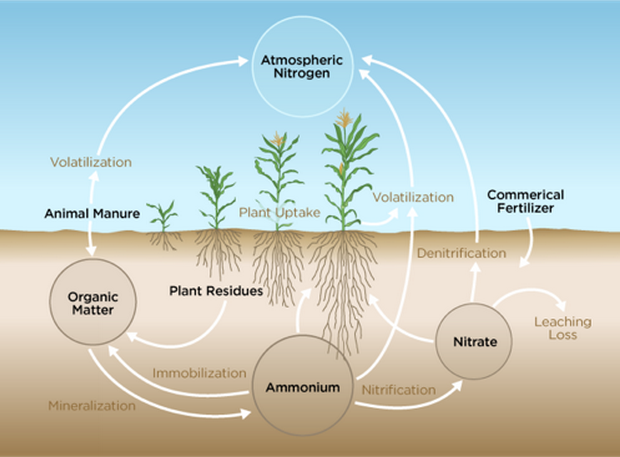 Nitrogen in the form of ammonia or ammonium is relatively stable in the soil, whereas nitrates are soluble and move with water in the soil, making them vulnerable to leaching. Having the right form of nitrogen in the soil at the right time can be challenging to manage. Iowa State University, University of Illinois and Purdue University, among others, recommend that fall nitrogen applications be delayed until 4-inch soil temperatures reach 50ºF or lower and continue to trend lower, unless a nitrogen stabilizer or nitrification inhibitor are used. There are many factors, such as soil moisture and compaction, that can have an impact on the stability of products like anhydrous ammonia. Significant rainfall events can leach the nitrate form of nitrogen out of the soil. It’s a fine balancing act. 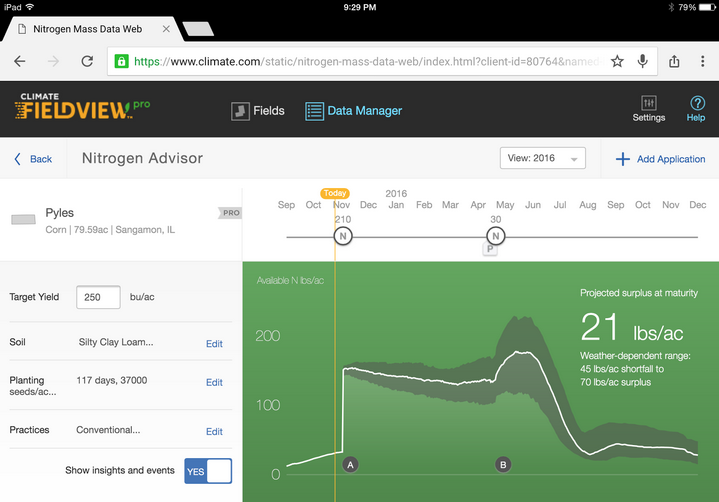 The Nitrogen Advisor in Climate FieldView Pro is a dynamic tool that factors in every step throughout the nitrogen cycle. It includes a number of subparts that estimate all of the interactions that affect nitrogen and how it is used. Ultimately, Nitrogen Advisor helps farmers and their agronomic advisors understand the estimated amount of available nitrogen in the soil based on specific inputs for each and every field in the operation. The tool also helps farmers understand the potential for having either a reserve or deficit of nitrogen by crop maturity next season. By running different scenarios and using the insights gained from Nitrogen Advisor, farmers and agronomists can confidently make an educated decision on application rates and timing. Earlier this week a farm in Illinois realized the potential of Climate FieldView Pro and Nitrogen Advisor in the planning of nitrogen applications this fall. A group of farmers in central Illinois recently purchased Climate FieldView Pro for their whole farm. They were wrapping up harvest and were preparing to shift focus to fall anhydrous ammonia applications. When they entered their field information into Climate FieldView Pro, their planned application timing this week showed a significant loss of nitrogen due to volatilization and ultimately a slight shortfall at the end of next season. Given the current dry soil conditions and temperatures, this made sense for the farmers. With the knowledge that rain and cooler temperatures were in the forecast, they ran a scenario in the Nitrogen Advisor that delayed their application until after the first of November. That slight adjustment resulted in an increase of 11 lbs/ac in the estimated nitrogen reserve at the end of the season, which means they saved 11 lbs/ac from being lost into the environment. From a dollars and cents perspective, they avoided wasting anywhere from $5 – $10 per acre. You, too, can use Climate FieldView Pro and the Nitrogen Advisor to make sound fall fertilizer application decisions. To learn more, contact your local Climate Pro Certified Dealer. Connecting to a local dealer for service and support is the best way to get the most out of Climate FieldView Pro. You can use our handy Dealer Locator to search by your zip code and find the dealer nearest you. You can also find out more by visiting www.climate.com or by e-mailing support@climate.com.